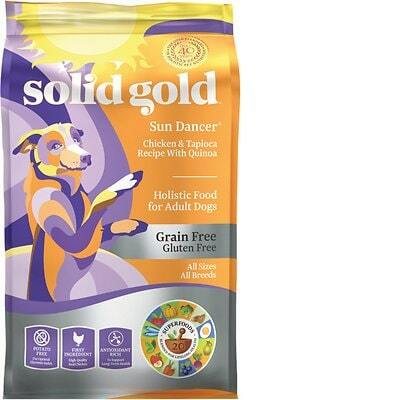 Solid Gold Sun Dancer is a mid-priced dog food with average quality. This product has 1 controversial ingredient, but no artificial preservatives, colors and flavors. It has a somewhat high amount of carbs, compared to its protein and fat but the meat and fat quality in the food is excellent. Solid Gold has a below-average number of recalls and was very transparent when answering our questions. This food has a fair amount of protein fat but is somewhat high in carbs, which is lowering the fat content slightly and making it less nutritionally balanced compared to other dog foods we evaluated. Carbohydrates are cheap so they keep the food’s cost low. They are nutritionally useful to dogs in the right amounts, however, high amounts of carbs can reduce the much-needed meat-based protein and fat content. The average dog food we reviewed has 39 total ingredients, with 1 controversial ingredient. This food has 1 controversial ingredient, see below. Chicken is a nutritious meat that provides protein, fat and other nutrients to dogs. Raw meat contains about 75% water which is cooked off during the making of dog food. This leaves only a fraction of the protein content in the final product weight. We recommend looking for dog foods that also include meat meals in the first five ingredients (pre-cooked meat powder that contains four times the amount of protein). However, chicken is generally a healthy dog food ingredient. Tapioca is a gluten-free starch extracted from the root of the cassava plant. Because it mostly consists of carbohydrates and is low in fiber, Omega-3 and Omega-6 fatty acids, we do not consider this a high-quality dog food ingredient. Fish meals are the result of cooking. Water is removed from fish meat to create a protein-rich meal powder. Fish meals contain about four times the protein meats do, so generally, they're a good source of nutrients. While fish is generally nutritious, this ingredient doesn't identify the species it comes from making it questionable and intransparent. This includes the potential that rancid, dead, dying, disabled or diseased meat sources could have been used. For that reason we do not consider this a high-quality ingredient. This dog food is made in the United States of America - that’s fantastic because of the strict food manufacturing rules and regulations here. Chicken, Chicken Meal, Salmon Oil, Almond Oil and Sesame Oil have one thing in common - they are clearly showing buyers what animals and plants they are made from. That’s what you want to see. We wish the same could be said for Ocean Fish Meal, which doesn’t tell you which fish it comes from, bringing into question the quality of this ingredient. Solid Gold Sun Dancer Chicken & Tapioca Recipe uses 0 controversial artificial preservatives, excellent. It’s good to know that ‍not all artificial preservatives are bad. That’s because they serve an important purpose, which is to prevent food from spoiling. However, we consider 11 artificial preservatives controversial because of their potential link to cancer and other serious health conditions. The lack of preservatives is matched by no artificial colors, well done. No artificial flavors are used either. This product manages to ace all three “artificial ingredient” checks - that’s how it should be. 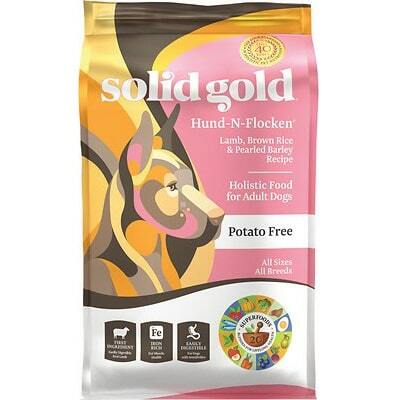 Solid Gold has a below-average number of dog food recalls. 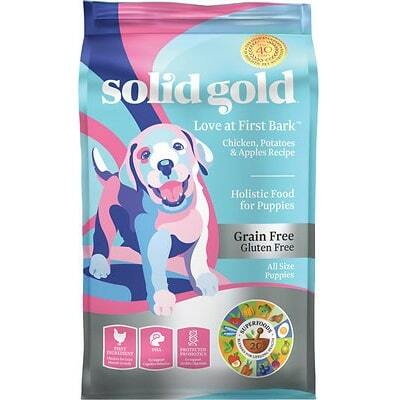 Solid Gold WolfCub Large Breed Puppy Food, 4lb, 15lb, and 33lb, with a best before date of December 30, 2012 and batch code starting with SGB1201A31X. Product labeling reads in part:" LARGE-BREED PUPPY DOG FOOD SOLID GOLD WOLFCUB MANUFACTURED FOR: SOLID GOLD HEALTH PRODUCTS FOR PETS, INC. EL CAJON, CA 92020 NET WT 4 LBS./1.81 KG ". 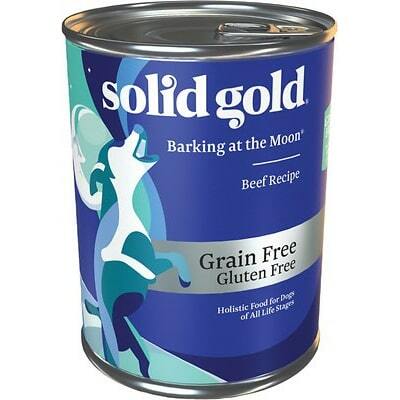 Solid Gold WolfKing Large Breed Adult Dog Food, 4lb, 15lb, and 28.5lb, with a best before date of December 30, 2012 and batch code starting with SGL1201A32X. Product labeling reads in part:" LARGE-BREED ADULT DOG FOOD SOLID GOLD WOLFKING MANUFACTURED FOR: SOLID GOLD HEALTH PRODUCTS FOR PETS, INC. EL CAJON, CA 92020 NET WT 15 LBS./6.8 KG ". Products were produced at the facility that has been linked to recent recalls of Diamond brand pet foods due to potential Salmonella contamination. Solid Gold was exceptionally responsive to our first email. They were one of the few companies who responded within 1 day, and with relatively complete answers. We do have a Board Certified Veterinary Nutritionist that we keep on staff as a consultant. There was a 2nd email to ask for the nutritionists name, but they stated that they are unable to provide names of employees. That Nutritionist along with our Food Scientist (PhD) and Manager of Nutrition all formulate our products. We have done AAFCO feeding trials in the past, but now use a private kennel for palatability testing and use formulation and laboratory testing to ensure our products meet the AAFCO guidelines. Generally speaking, companies may choose to perform feeding trials that are different than the AAFCO feeding trial, and in some cases more complete. Our dry dog and cat food are made in the USA along with our wet dog food. Our wet cat food is made in a human grade, FDA regulated facility in Thailand and our treats and supplements are made in the USA. I am sure that our manufacturing facilities can be visited, I am just not sure how that is done. Solid Gold operates what is called a Positive Release program. All ingredients are tested a minimum of 4 times before entering our manufacturing facility. Samples are retained hourly during production to ensure quality and consistency. Final samples are taken of each batch and sent to 3rd party labs for testing to ensure that all nutrients are within specifications and for food safety. Once they pass all tests and inspections, the product is released to our warehouse. This was one of the more detailed and complete explanations of quality assurance provided by a manufacturer. Solid Gold does not own their manufacturing facilities but we use privately owned manufacturing facilities. The name could not be shared. Absolutely no ingredients come from China.